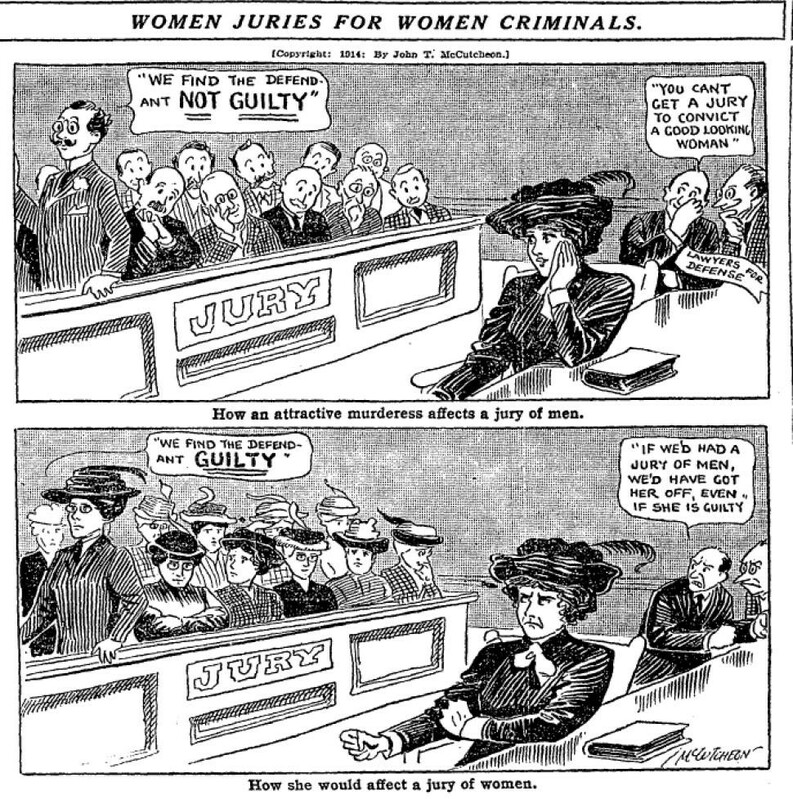 Bad News From the Past / We're Old "You can't get a jury to convict a good-looking woman"
Chicago Tribune, March 7, 1914. Women weren't eligible for jury service in Illinois until 1939, but that was arguably a small price to pay for the privilege of whacking their husbands with virtual impunity. Prima facie this seems like a pretty stunning structure of gender bias. But: there are some interesting contextual complications missing from Lesy's account. As I'll demonstrate in subsequent posts, white women in Chicago scarcely had a monopoly on getting away with murder. The fact is that most killers in Chicago and (and, to slightly lesser extent, nationwide) got a walk regardless of gender and no matter how strong the case against them was. The four exceptions to this rule, as we'll see, were wife-killers, cop-killers, homicidal robbers, and (surprise!) African-Americans. McCutcheon's cartoon generated an interesting echo in the city's legal system. The guy had clout, no doubt. The above-mentioned "unwritten law" is a whole other kettle of worms. I'll come back to that later too.